Q: Thank you for your efforts on the website. I find the information so useful that I go out of my way to do business with the folks who sponsor your site. Now to my question: I often fish with either cut plug herring or whole herring in a Pro Troll rotobait holder with an e-chip. I either mooch, drift mooch, or troll behind a dodger or flasher. Normally I use Gamakatsu Octopus hooks. Do you have any comments about using the octopus circle hooks with these methods? Thanks – Bob. A: If you are mooching or drift mooching the Octopus circle hooks are great hooks to use. 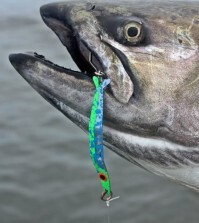 Be aware that you must let the salmon take the bait and swim away with it before setting the hook. Actually, the salmon will almost set the hook for you. 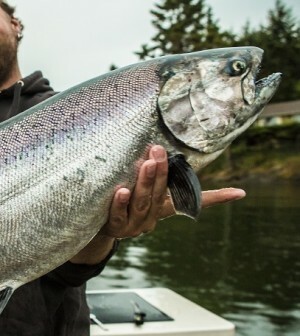 The nice thing about this is that the salmon is almost always hooked in the lip so it makes it easy to release the shaker with almost no harm. Once a fish is hooked on a circle hook, you almost never lose him. As for trolling with circle hooks, the J hook is more effective than the circle hook by far. A: Setting the tension on your release clips is largely a matter of preference. I try to set mine so that a four pound salmon will break it loose. 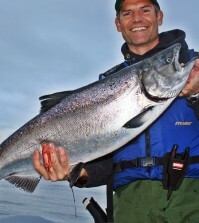 I often will adjust my tension tighter during a days fishing if kelp or weed in the water begins to build up on my line. The important thing to remember is when a salmon strikes, don’t set the hook as the tension on your release clip has already set the hook. 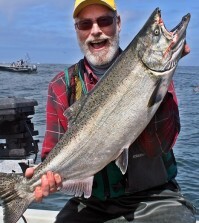 I have seen a lot of salmon that are lightly hooked lost, as the angler tries to set the hook again. A: I am going to refer you to a couple of articles on the Salmon University website. The first article is a step-by-step Herring Brining article by Tom Pollack that will walk you through the brining process. 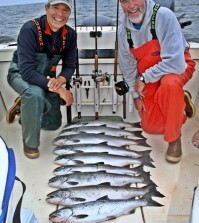 The second is an article written by Terry Rudnick “Bait/Lure Combos for Halibut”. 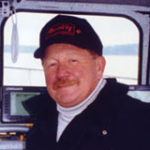 Terry is the co-author of the award-winning book How to Catch Trophy Halibut.